Home > Uncategorized > How Clear is Your Writing? As communicators, most business analysts will religiously use a spellchecker. After all nothing is less convincing than a misspelt document – it shows a lack of attention to detail. But there’s more to Microsoft Word than just spell-checking. 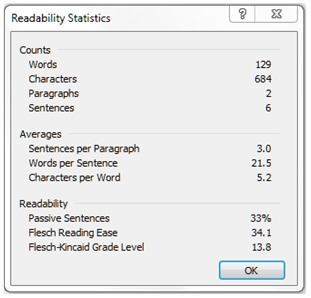 How many people take any notice of the readability statistics? These statistics give an indication of how easy – or difficult – a piece of text is to read. The two Flesch figures at the bottom both measure readability, but in different ways. This example – a spell check on part of the National Broadband Network’s corporate plan – shows a Reading Ease of 34 (classified as difficult). The Grade Level (13.8) indicates that the text can be understood by an average English speaking reader who has attended school up to the age of 18 in the USA. Articles from recent editions of The Age and Herald Sun (Melbourne’s daily newspapers) had grade level scores of between 8 (standard) and 15 (difficult), with the average being 10 (fairly difficult). Random samples taken from the Business Analysis Body of Knowledge® ranged in grade level from 12 (difficult) to 18 (very difficult). When writing documentation with a high level of technical and business content it’s almost impossible to register a score of anything less than difficult. However once your writing hits grade levels of 15+ (Reading ease: very difficult) then you have to ask yourself if you’re informing – or confusing – the reader. * Whilst using a small number of user representatives where a large number of users are involved is not an ideal solution, that problem is a direct consequence of undertaking a large system and will exist no matter what development approach is used. This paragraph has a grade level of 20 and is not the easiest to read or to understand. * Where there are a large number of users, you may use a small number of user representatives. This is not ideal but is a direct result of building a large system. No matter what development approach is used, you will have that problem. As you will notice, using short sentences is one of the easiest ways of making text more readable. A sentence which only makes one point (if there are a large number of users you may use a small number of representatives) is much easier to understand than a sentence trying to make several points at once. People tend to absorb facts one at a time. Short paragraphs with fewer sentences are another useful technique. Most documents are read online these days so breaking text into scannable chunks will make it easier on the reader – and more likely to get read. Use paragraphs to make your main point and use the sentences within that paragraph to cover the most important individual points. Of course just because a document is well written doesn’t mean it will get read – but then that’s another issue! This article has a grade level of 10.7 and a reading ease of fairly difficult.